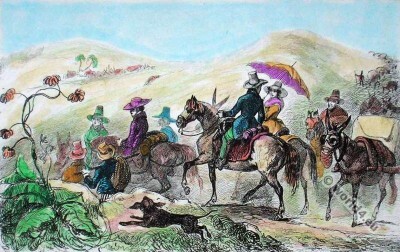 Brazilian merchants ride to Rio de Janeiro. Home » Brazilian merchants ride to Rio de Janeiro. Brazilian merchants ride to the market at Barra da Tijuca in Rio de Janeiro, 19th c..
Caravane de marchands allant a Tijuca. Source: L’Univers, Histoire et description de tous les peuples, Paris. This entry was posted in 19th Century, Brazil, Latin America and tagged Traditional Brazil costumes on 5/28/15 by world4.